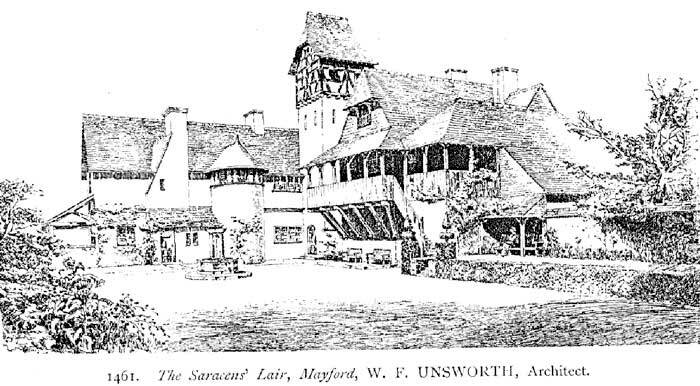 Originally called The Saracens’ Lair, this house was built around 1900 at much the same time as Fishers Hill, and is situated on the southern face of the escarpment, fronting Saunders Lane. W F Unsworth, an architect of some renown, designed it. He had been trained in Bath before moving to Paris in 1872 where there was an abundance of work in the aftermath of the Franco-Prussian War. After spending some time travelling in Europe he returned to England and began practising in London. His first important commission was the Shakespeare Memorial Theatre and Library in Stratford-on-Avon. The design shows a strong French Gothic influence, but in his later works his enthusiasm for English Medievalism becomes more apparent. Among his other commissions, in addition to a number of significant private houses in England and Ireland, were a cottage hospital in Potter’s Bar, a brick-fronted warehouse in Star Yard off Chancery Lane and schools at Baron’s Court. Locally he designed Christ Church in Woking and the restoration work to St Mary’s Church, Horsell. Unsworth was also a talented artist who exhibited at the Royal Academy. A fine sketch by him of Saracens Lair was published as an illustration in Academy Architecture, 1902. The drawing differs in minor detail from the actual building, so was presumably an early design sketch used to gain his client’s consent to the design. 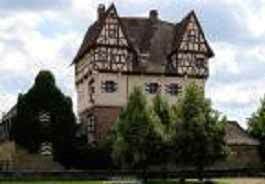 The most striking feature of the house is the so-called “Nuremberg” tower that adds height to the building. Local folklore has it that it was included to annoy Gerald Balfour, who was alleged to have said that he did not care what kind of house was built so long as he would not be able to see it from his new house at the top of Fishers Hill. Saracens is recognisably in the Arts and Crafts style, but with distinct mediæval influences, particularly noticeable in the external timbered balcony. The design of the tower is reminiscent of the architecture of the Nuremberg region of Germany that Unsworth may have sketched during his time travelling in Europe. Water for Saracens was pumped from a borehole higher up the escarpment, but still within the extensive grounds. At some time additional land to the south of Saunders Lane (where Cliff hatch Stables is now) and land to the west of Hedge Cottage was acquired. In all, the grounds extended to some 28 acres (11ha), although they have since been reduced to just two acres. The 1896 Ordnance Survey Map shows the land on which Saracens was subsequently built as a 3.800 acre plot extending up Fishers Hill from Saunders Lane. A line of three cottages fronted the lane. The most easterly one is still there today, called Hedge Cottage. At the top of the hill and butting the northern edge of the land a further plot measuring 2.170 acres contained two small buildings. To the west of Hedge Cottage was a nursery of 2.857 acres and above it an adjacent plot of 2.720 acres. On the southern side of Saunders Lane a large area of 17.790 acres stretched down towards a tributary of the Hoe Stream. The map that accompanies the 1902 Agreement between Woking Urban District Council and The London Necropolis & National Mausoleum Company concerning the upkeep of certain roads within Hook Heath shows Saracens in place and belonging to W S Harrison Esq. The middle cottage had been demolished, leaving Hedge Cottage to the east and the other cottage to the west of Saracens and facing Saunders Lane. Mr Harrison’s land holding extended up Fishers Hill and included land at the top of the escarpment on which Little Wissett was later built. By the time of the 1916 Ordnance Survey a glasshouse had been constructed in the garden; also part way up the escarpment a building (presumably the pump house) had been built, and the land where Well Cottage is now is shown as a separate plot within the curtilage of Saracens. Mr Harrison had also acquired the land to the west of Hedge Cottage and the plot above it. The 1934 Ordnance Survey map shows Saracens, now with a gatehouse in place of one the cottages and a geometrically shaped construction, possibly an ornamental pond, on the garden above Hedge Cottage. The latter cottage remains part of the property, but has its own designated garden. Kilmorie and Wissett Cottage have been built at the top of the escarpment. The land south of Saunders Lane is designated a sports ground. The 1901 census records the house as occupied by Mr William Sidney Harrison and a married couple who served as his butler and cook. The head gardener and his wife were living in Hedge Cottage. Harrison was a bachelor who had previously lived with his parents in London where he practised as a solicitor. A ten-bedroom Edwardian country house seems a curious choice of residence for a bachelor, but perhaps he needed to host weekend house parties, as was fashionable at the time. The Harrison family had previously lived at 10 Lancaster Gate, Kensington. His father was a member of the Stock Exchange, as was one of his brothers. Another brother was a solicitor like Sidney and another brother was a barrister. William was the last to leave home, and in 1891 at the age of 51 he was living with his widowed mother and their retinue of servants at 17 Queensgate Place, Kensington. Harrison was still living in Saracens at the time of the 1911 census. The staff had changed and now comprised a housekeeper, valet, housemaid and kitchen maid. The same head gardener and his wife were in Hedge Cottage. Harrison died in 1913 and the house was sold the following year. In 1951 the owners decided to downsize and move to Hedge Cottage, the former gardener's home with eight acres of the garden, part of which was now an orchard. The pump house and surrounding land at the top of the escarpment was sold separately, and the house itself was divided into Saracens and West Saracens. At some point the land south of Saunders Lane was also disposed of. Subsequently, a sequence of owners made internal alterations and improvements to both parts of Saracens, not all of which were in keeping with the original style or quality of workmanship. Fortunately, more recent owners were able to re-unite both parts of the house in 2001 and to set about lovingly restoring as much as possible of the interior, while redesigning the garden to incorporate a swimming pool and elegant outbuildings. The result is an impressive house that combines Edwardian elegance with modern comforts. Unusual features include a gymnasium in the tower and a basement that includes a state-of-the-art-cinema as well as more conventional storage areas.